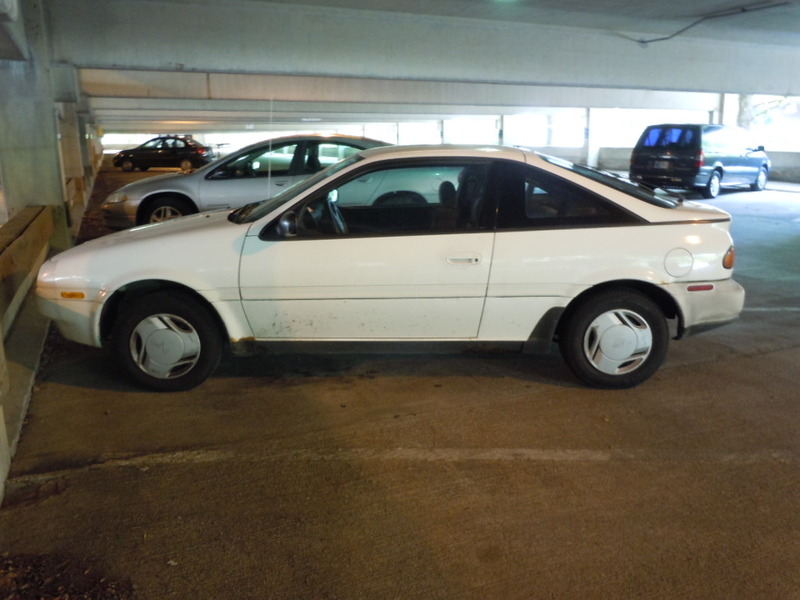 Ack–another white car! Don’t have my head; I capture what comes my way and it’s truly perplexing how I encounter so many cars of the same color; unfair, even. For what it’s worth, these were actually popular in this color, so maybe it’s not a stroke of bad luck. Actually, finding one of these might be considered good luck, as they’re a rare gem from Nissan’s short-lived early ’90s renaissance. Like the concurrent Maxima and Q45, this Sentra-based coupe was a reflection of the company’s drive toward sophisticated shapes and spirited powertrains. Keep in mind that’s mostly true of the SR20DE-equipped NX2000, but with variable intake cam timing and 115 rev-happy horses, I wouldn’t call this a 1.6 a dud for daily duty–you just have to flog it to fly around dimwits with ease. When was the last time any of you saw one of these? As cars released at an inauspicious time, they were far from popular, but sales could’ve been worse, and I saw them regularly as a pre-teen. Still, it’s been a good fifteen years since these were plentiful on the ground, and I’d wager poor reliability isn’t why they’ve become so scarce. Nissan’s quality relative to other makes was at or near its peak in the early ’90s, after all, so people either thrashed them to death or failed to love them enough. Cars based on this chassis, though, are always likeable. I’d lump this write-up in with the contemporary Sentra, but you don’t wanna read all that and anyway, those had a mini-BMW vibe, where this seemed more like a belated CRX rival. 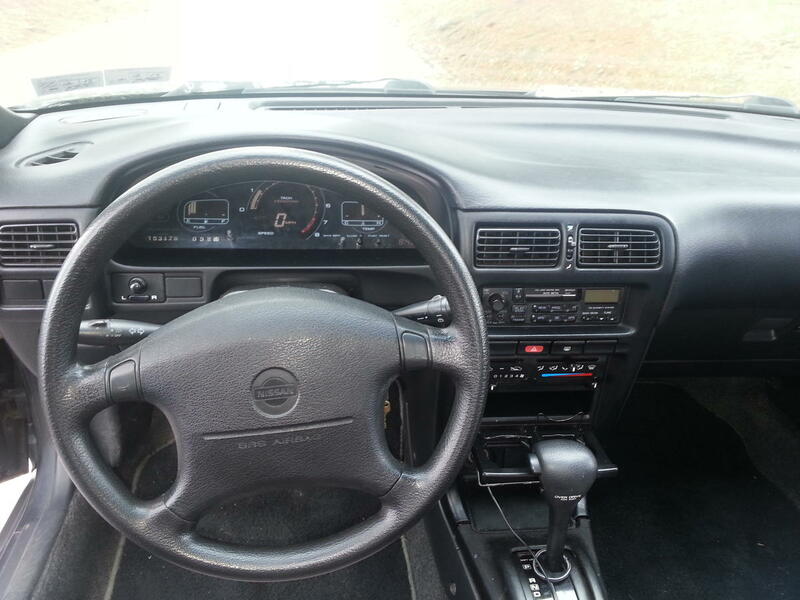 The Sentra connection is obvious inside, though, as the NX used the same dashboard. I didn’t want to use a flash, and the only shot of the interior which was unblurred featured my partner in the background in what he’d consider to be an unflattering pose. If he read CC, he’d apply for a gun license and do away with me for posting such an image. Material quality was high; more so than in an equivalent EG/EJ (1992-1995) Civic, and a bit richer than the equivalent Corolla (unless we’re talking the slow-selling ’93-’95 LE). Properly sporting NX2000s used an analog gauge set-up; this digital display was for the 1600 only. Gotta add some flair to the poseur model, I suppose. Flair is exactly what you don’t see with these thirteen-inchers–today’s CRZ wears 195/55 R16 tires, with 205/45 R17s optional (W speed rated for some reason). I’ll take this Nissan over that car, tiny tires and all. At the time, the final NX was derided for being porky relative to the outgoing second-gen CRX, but by today’s standard, it must feel like a roller skate. With a relatively long 95.7 inch wheel base shared with the Sentra, it could’ve been twitchier, but even the sedans could get tail-happy (fun, if expected). Some fourteen-inchers would curb that tendency and would be easy enough to find, but in any case, this generation of Nissan’s B-chassis brought the car from an also-ran to a class leader where driver fun was concerned. The following generation, with its beam axle and unique scissor-link, was a determined understeerer, but that was more related to Nissan’s decision to fit the rear suspension with extra-soft springs; modifications can fix that, adding balance with stability. These were introduced in the US for 1991 model year and withdrawn after 1993. I’ll be the first to admit that focusing on the Sentra SE-R was the wiser strategy, not that that car got the sales success it deserved, but the close-coupled cabin and fastback shape of the NX has its own obscure appeal. It’s quite dated and was easy to dismiss as corny even when new; like Chrysler’s embrace of Fuselage styling, Mazda’s, Mitsubishi’s and Nissan’s switch from the ultra-dated box to the softly-defined organic look was sudden, zealous and faddish. It’s a look I like, but criticism of the passing craze is easy to understand. And as was the case for domestic manufacturers in the ’70s, the Japanese carmakers who adopted a more restrained interpretation of the soap-bar look were more successful (think 1994 Accord or 1993 Corolla), though that could be related to issues of brand equity as well. Toyota and Honda had it, others had to work for it and often couldn’t attain it for long. Such was the case for Nissan and if today’s Sentra is any indication, any attempt at changing this situation in the compact class has long been dispensed with. If that means more GT-Rs, Q50s and 370Zs, I’ll take it, but a fizzy runabout is more my scene. These days, that’s Ford’s territory more than anyone else’s. As it is, these cars were very well received critically, and went on to success in SCCA racing in two-liter trim. Equipped as it was with a limited slip differential and a big two-liter with a 7500 rpm redline, this blew the lively but mild mannered CR-X out of the water (in stock form, anyway) and made the smooth and refined Mazda MX-3 (above) look somewhat limp–good thing there was the MX-5. Rejecting this NX1600 as a secretary’s car is fair enough, but if a car like the NX2000 can’t put a smile on your face, I recommend an examination of your neurological faculties. On the other hand, if you overlook the NX as just another in a sea of econoboxes, you’re not alone. As Paul explained to me in a comment thread on Thursday, people usually don’t buy cars based on objective measures and this car makes a strong statement in favor of such an argument. Image and timing are everything, and in too many cases, neither worked in Nissan’s favor. 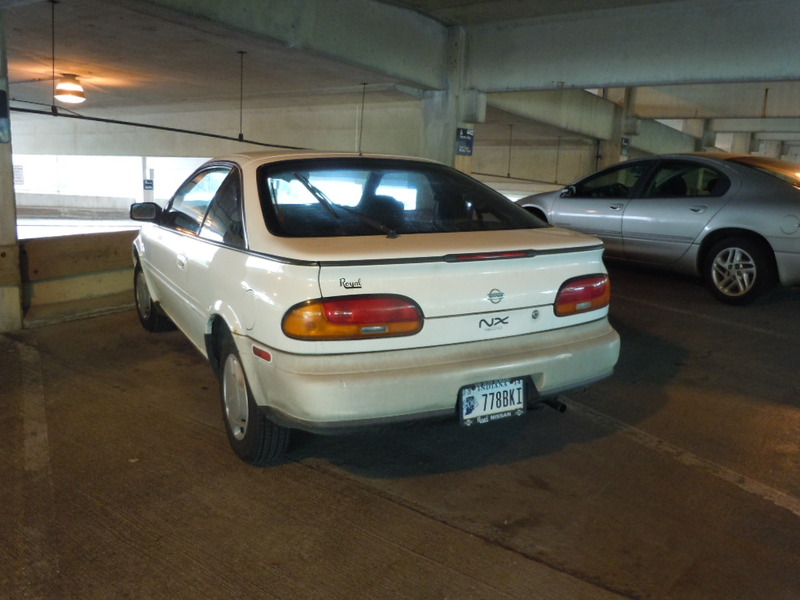 Curbside Classic: 1992 Mazda MX-3 GS – Smallest Production V6 Engine Ever? These were rare and unusual even when new. The NX 2000 with t tops was the hot setup! I think the styling had a lot to do with the lackluster sales. People will often buy cars that are no fun to drive if they look good, but the other way around is a tougher case to make. Even when these were new, I thought they were hideous and their styling has not improved with age. The mechanical package, at least of the NX2000, was not without appeal, but I’d have much rather had it in a Sentra SE-R. That generation Sentra two-door wasn’t what I’d call gorgeous (although I do think it cleans up okay), but it at least had the virtue of not looking like a gigantic hard-boiled egg that’s just been coaxed away from the dog. In fairness, I don’t think a lot of small coupes of this period look much better. The MX-3 is less distressing (at least without the hideous pockmarked alloys the early GS had), but not a great improvement, nor is the first Opel Tigra or the old Ford Puma. The Puma is probably the best-looking of the lot, but even there, the proportions are awkward. From the outside, I agree with you. Maybe it’s because of the Porsche comparisons some magazines made when this car was new, but to me the NX looks like a continuation of the shrinkage from 928 to 924, a sort of ’90s 914 replacement. The Sentra SE-R was a better-styled car. I know the SE-R, though–a 1991 was my grandfather’s last car, and the car I learned to drive a manual transmission on–and I’ve always thought the NX would have been much better from the driver’s seat. The SE-R felt bizarrely upright, open, and econocar-like, given that its engine wanted to rev past 7500 rpm and the tires wanted to carry irresponsible speed into corners. The steering felt light and wooden in that car, the gearshift crunchy and rubbery, and despite the seats’ beefy bolsters I felt like it would have been improper to use them to the fullest. Possibly this was all because this was the patriarch’s car, which I didn’t want to risk abusing. But I’ve always wondered if the lower-slung NX 2000 offered charms well beyond the SE-R, even though it doesn’t seem to be held in anywhere near as high regard nowadays. I’ll be honest when I say I completely forgot about these cars. They kind of blend in with the similarly styled MX-3, Toyota Paseo, and Geo Storm, all of which have been extremely uncommon on the roads for many years now. Overall the styling is inoffensive, but those recessed headlights always made it look like an anteater to me. 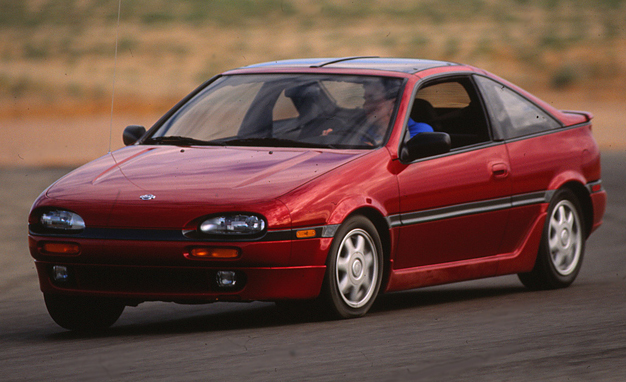 It is too bad that most manufacturers don’t offer small sporty coupes anymore. The Forte and Civic coupes are probably about the only ones left, and neither are particularly sporty, emphasizing function over form. Me too, and its probably worse for me because I was of car buying age when they came out. But from the late 80s to the mid 90s, I kind of checked out of new cars. You’re right–there is some Hirschberginess (new word) about this. And I enjoy their looks as well. Has there been a CC on the Geo Storm? I kinda liked them when they first came out but too many pink ones around here ruined that quick. They seemed to be everywhere for five years then they were gone. As others have said: “…rare when new”. These hit the market when I lived in Memphis and in my 20+ years there I saw MAYBE 4 or 5….and I don’t recall ever seeing a white one. Usually, these were red or black with the 1600 out numbering/out selling(? )the 2000 by at least 2 to 1. Also, no matter the engine, the majority were automatic equipped. I think part of the reason these did not sell is the same reason the MX-3 did so poorly….they really weren’t a practical choice for a lot of people, even with the hatchback. Folks who bought Sentras did not cross shop the NX. These have gotten so rare I’ll bet they can’t even be found in wrecking yards anymore. I really like these little things, until I get a good look at the front end. A 240SX-ish nose would have worked so much better. How did these cars pass the minimum headlight height requirement? Very rare in western PA, and it seemed like 90% of the ones that were sold were in what can best be described as screaming yellow. And by far the most of them were 1600’s. A nice, although odd, car. 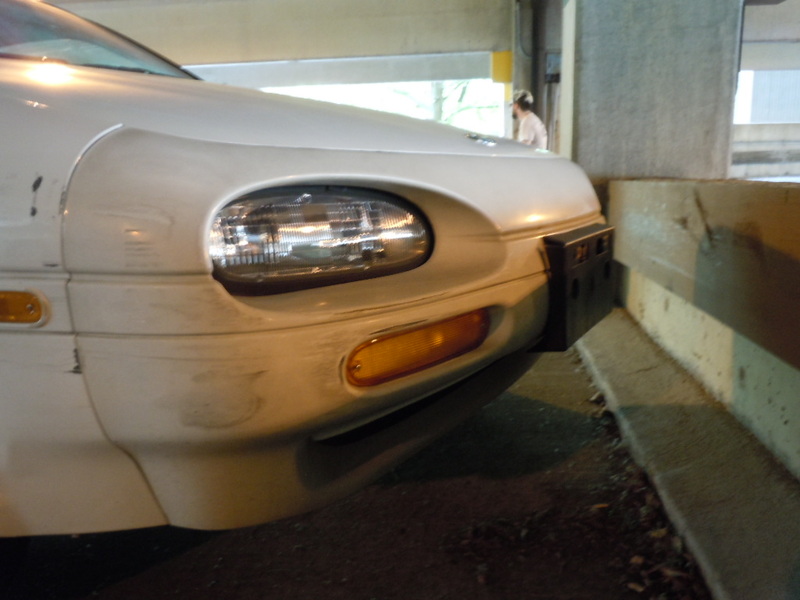 Unfortunately, there was this little matter of the Mazda MX-3. With the six cylinder, a much more enjoyable car. Definitely a car to drive and not look at the outside of. We got the 2-litre only in Australia but the Pulsar SSS hatch that shared the drivetrain as well as platform (I think, the Japanese makes had so many quarter-size step variations then) were much more common. A comprehensive round-up of small coupes from this period would be interesting, from the bland Toyota Paseo to the challenging Ford Lynx or the out-there Toyota Sera that had the dihedral opening doors. They basically don’t exist today (apart from the CRZ and I suppose you could include the 86/BRZ/FRS), but do many people miss them? I see all those on a too regular basis to miss them the Mazdas the Lynx was rebadged from are quite common in NZ as is the entire Nissan range lots of it imported ex JDM and amazing amounts have survived even these NX arent exactly rare. The one that always puzzled me about the B13 Sentra SE-R is why didn’t they offer a four-door? Surely the slight tradeoff in shell stiffness and weight would be more than made up for by the additional sales. When these first came out I wondered what the hell are they thinking? There was the Pulsar and Pulsar NX but were they really that bad that the Pulsar name had to be dropped. I thought the Pulsar too was kind of misplaced and stood out from the pack in a not so good way. The Sentra was a nice enough looking car but this one was just… different. A kind of Sentra wannabe. These were rare, I think that there was an available t-top version too, what I found odd was that the base version had the digital dash, these replaced the LEGO set Pulsar NX that could convert from a hatchback to a wagon, I always thought those were neater than these. If ever there was a fun sleeper car, this is it. My partner and I owned 2 Ruby Red Pearl NX2000 with T-tops, a 1991 and then a few years later a 1992. One of the past fun cars our there. The SR20DE was fun and torquey and it had a limited slip front different that was able to put the power down. The T-tops were a fun feature. The handling was solid and one could boot out of corners with little drama. Not much room in the back but for 2 people and their weekend gear it was fine. Tire size was odd and we had a a hell of a time finding tires. Wanted to swap out the regular gauges from the NX1600 because I love digital dashes but that was a project we couldn’t get around to. Great post! Thanks for the memories. I’m not sure but believe the T-tops were standard on the 2 liter version…not sure they were even optional on 1600s. The digital versus non-digital instruments? I think these were the last Japanese cars sent to the U.S. with digital gauges. About the same time, though, Ford/Mercury had digital gauges on the T-bird/Cougar….and Mercury had them in the GS trim of the Sable (or am I thinking Grand Marquis?). I would think the Se-r was never offered as a 4 door for the same reason most other sporty compacts were 2 door sedans…buyers were thought to be primarily young/unmarried guys. Besides, Nissan/Infiniti offered the G20 4 door sedan (and 5 door sedan and wagon in other markets) with the SR20 and a manual or automatic…almost an Se-r 4 door. I always liked these. But I like the MX-3 better, and of anything small and FWD from this era, now I’d probably want an EG Civic hatch with a B16A swapped in. 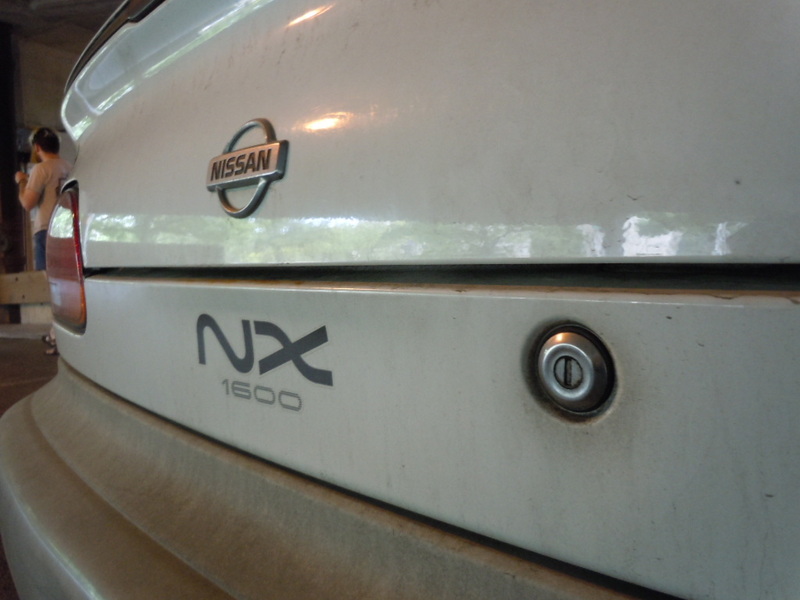 I seem to remember that the Sentra SE-R had a VLSD while the NX2000 didn’t, but my memory is hazy on that point. An NX is what I should have had next after my (white) Pulsar NX. I never was crazy about the ovoid styling; a striking contrast to the Origami look of my Pulsar. Still, it would have made a great runabout; I would really love to have one of these now. It’s too bad none of these types of cars (MX-3, Storm, Paseo, Pulsar, etc.) are offered anymore. I liked these too, very ‘jellybean’. Perhaps they were a bit more common up here in Canada because I’ve seen many over the years. Their numbers seem to have dropped off sharply in the last few years though. I can usually find at least one on vancouver’s Craigslist at any given time. I read somewhere they had the nickname the ‘egg’. I remember driving the nx2000 when I was looking to buy back in 92. I ended up buying an integra. The 2000 was fun, but seemed tiny even compared to the integra coupe I was looking at. In the end it was fun but it just didnt seem to compare in quality or in performance to the integra. It was a nice car though just nothing memorable about it. I see these in Chile from time to time. I like the styling, and might be tempted to get one someday. But I can see he design must have been more of a liability when new. I imagine it might have been considered odd and girly. Speaking of a smile on my face, twenty years ago I had the privilege of track time in an NX2000. The very same one, as it turned out, that won the SCCA Showroom Stock championship in its class. I was a reporter then, and a local government official was the driver, so I talked my way into the driver’s seat for a George Plimpton-style first-person experience. I drove it hard enough to spin it on one corner, but after a few laps I was able to lap at 1:40 or so, within 10 seconds of the champ’s time. 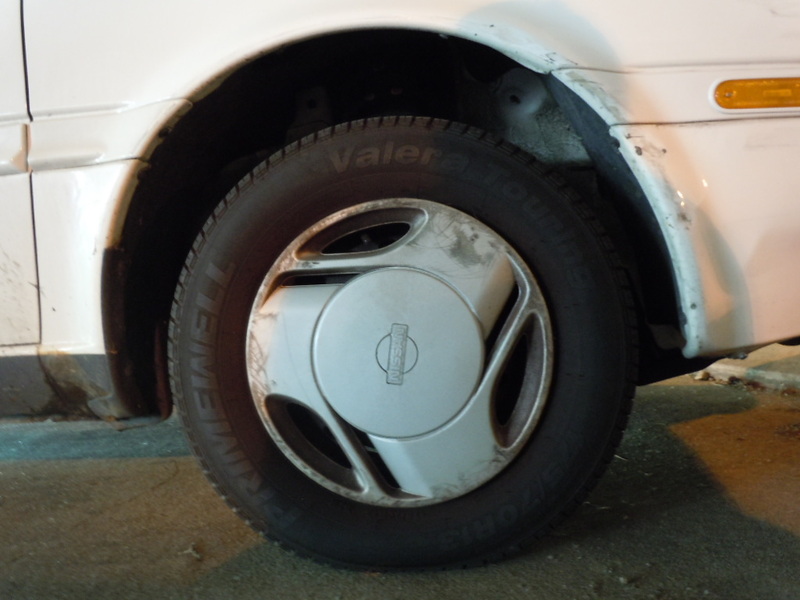 I was so ragged and inexperienced that I was chipping quarter-sized chunks out of the tires, but he didn’t care– he had a tire sponsorship. This was a very small car once you installed a roll cage and put on a helmet, but it was well worth the claustrophobia. It al happened at the old Second Creek racetrack, which was swelled up and paved over by the runways of DIA. Good memories! I had nearly forgotten these little guys, but seeing the photos brought a positive reaction as I always did like the (admittedly quirky) styling. Make mine a 2000 though–the little bitty 13″ wheels on these always seemed way too dinky. I think the NX2000 had at least 14″ rubber if not 15″, didn’t it? Plus the t-tops and the more powaR. As far as the “small early 90’s Japanocoupes” go the NX2000 would be my favorite. 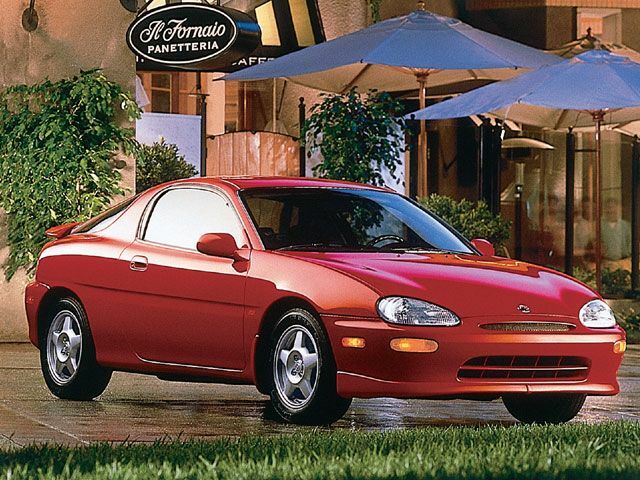 I always found the MX-3 rather homely, even if the V6 version had it strong dynamic and technological points. My opinion has not improved with time–it’s weird in a weird way, as opposed to weird in a good way like the NX. The Storm was kind of generic in comparison, looking kind of like a way-belated Opel GT wannabe, and while much more common, they all started looking like clapped-out beaters within 10 years. Plus the huge numerical advantage of base model Storms driven by high school girls as opposed to the better-performing models. And the Impulse, while better looking than its platform twin storm, was a pale shadow of its long-snouted forbear. The CRX almost doesn’t seem to belong in this group, maybe because it seemed to be nearing the end of its model cycle while these were rising. It’s also held up by far the best styling-wise, but being a Honda, it was never very dramatic. Just quietly attractive. I was trying to think of what Toyota’s entry would be…I guess the Paseo? I don’t think there was ever a sporty version though…an altogether forgettable car. We should have gotten the Sera; those gullwing doors sure do make an impression.